Building on a legacy of innovative and new products, Chaparral is pleased to introduce the 300 OSX at the Miami International Boat Show from Feb. 14-18 (Booth A141). Creating an entirely new class of boats, the Outboard Sport Luxury (OSX) is a blend of sport boat combined with the functionality of a center console with outboard power. The 300 OSX features a spacious inviting bow area that offers a fully integrated wraparound sun pad (without the need for conversion) and seating with luxurious details and comfort perfect for entertaining. Bow armrests, integrated speakers and cup-holders, and room to move around provides an entertaining space that rivals any cockpit layout. Behind the elegant windshield, the centerline helm position has two standard 9″ multi-touch displays that are angled for perfect viewing and accessibility. The dynamic oversized helm seat system offers comfort for long-range cruises and dockside entertaining. In an unprecedented move, the helm seat can be rotated from the navigation position to the starboard deck wall creating an open cockpit atmosphere for entertaining without compromising access to a spacious below deck cabin area. Moving aft, seating on the 300 OSX utilizes Chaparral’s new Vista View lounge, which can change position with the push of a button. The Vista View lounge is designed to allow full length lounging in the forward or aft positions. This, along with the dual position helm seat, gives the 300 OSX one of the most innovative cockpit interiors available. Going one step further, the 300 OSX cockpit is covered with a large, integrated fiberglass hardtop system complete with lighting, bonded skylight and an optional Sure Shade to extend the sun coverage. All Chaparral boats come equipped and ready for action; however, there are a number of upgrade options and premium packages available. 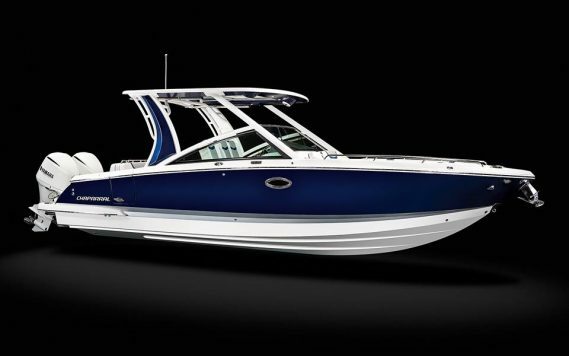 For more information and pricing, please visit www.ChaparralBoats.com.